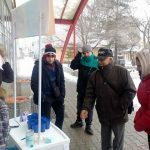 Bor, February 9th – Insired by one of the Serbia on the Move’s 13 points – that modern education and science should always be available to us – Eastern Front, club from Bor, celebrated the International Education day by organizing street action. The club members prepared a task for their fellow citizens – if they managed to throw a candy into a glass, they got the opportunity to answer the question regarding education. Some of the questions were who is the current Minister of education, how many high schools teher are in Bor, what the first school in Bor was, what the highest degree of education is. For every correct answer the participants recieved a book, and if their answer was partially correct their award was an origami candy box made by the activists themselves. Even though the temperature was low the citizens of Bor were glad to take part in the quiz.